Sample shown in typestyle EEEB in Navy ink. A Classic Favorite. Now in Raised Ink. Features 25 large cards, 25 medium cards, and 25 enclosures with 75 matching envelopes. All cards are a double thick stock color of your choice. 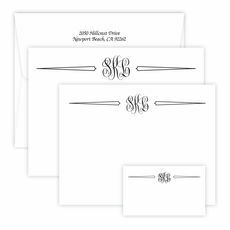 Printed return address and optional envelope linings available for large and medium size note cards. 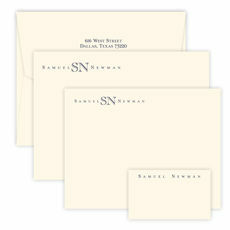 Large cards feature up to 5 initials (all capital letters in the same size type); medium cards and enclosures feature a full name. Your choice of typestyle and raised ink color. Positioning only as shown. Large size note cards are 7" x 4.8"; medium size note cards are 6.2" x 4.5" and enclosures are 3.5" x 2".